It’s not enough to spend more on education. We must direct money where it’s most needed. 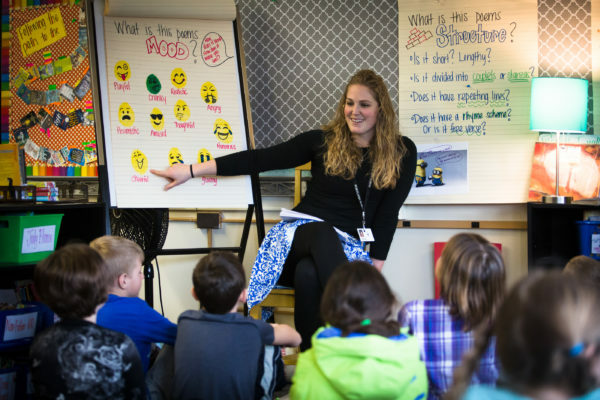 Longfellow Elementary School fourth-grade teacher Sarah Rasmussen talks about what moods a poem can set with her class in Portland. In the halls of Augusta the discussion about achieving the goal of state funding of 55 percent of the total cost of education has been constant and contentious since January. But what are we actually talking about? Fifty-five percent of what costs? Who will be the winners and losers? How should current and increased state subsidies be prioritized and allocated so that these funds will have the greatest impact on student outcomes? Therein lies the debate. Throughout the state, the public is being given the impression that every school unit will receive at least a 55 percent state subsidy. Not so. The current school funding model — the Essential Programs and Services — is based on what is needed for an adequate education. Should a local district choose to increase educational opportunities for their students beyond what is considered adequate, that increased cost needs to be paid for by the local taxpayers. What exactly are we supposed to be funding at 55 percent? This has become somewhat of a mystery as the list has changed over the years. Student instruction, special education, facility maintenance, debt services, transportation and vocational and technical instruction are just a few of the items that need to be funded. There are also two separate costs the state incurs that pertain to teacher retirement. One is funding current teacher retirement, for which the state’s contribution is 45 percent. Because retirement costs are a significant cost born by the state, state law was clarified in 2011 so these costs were included in the total cost of K-12 education and what amount would be necessary for the state to achieve its 55 percent share. This isn’t a new cost. The other is the unfunded actuarial liability payments, health insurance and life insurance, for which the state pays the entire cost, at a $172 million price tag. Some in Augusta have outstated the impact of including the unfunded actuarial liability as part of the state subsidy to achieve 55 percent, saying it will increase property taxes by $77 million. But it’s property owners and residents, not the state, who determine property tax increases. In fact, it is the state that helps keep property taxes down in those districts least able to afford to fund their schools. The Essential Programs and Services model is an equity based model. Monitoring the local school budget process and requiring choices be made to control costs is the best way to keep taxes under control. This is a local decision. A third of the 257 School Administrative Units receive 55 percent or more state funding. A third get little to no funding, and the remaining third are anywhere in between. The formula for state funding is based upon student enrollment and tax valuation. There will always be winners and losers. For some schools, the state will cover up to 80 percent of the cost of education, whereas for others the state covers less than 10 percent. The largest portion of the state’s biennium budget is education, accounting for 45 percent, or $2.3 billion, of the total. With the passage of Question 2 last November, the focus in Augusta is on funding 55 percent of the cost of education. But it is not enough to simply add more money for education. It is critical to set priorities and allocate the funds where they will have the greatest impact on student outcomes. More funds need to get into the classroom. Only 59 cents of every dollar spent on education reaches the student. The goal in the House Republican budget proposal is to increase it to 70 cents of every dollar. The reforms the House Republicans propose are aimed at preventing the need for significant additional funds, just a reprioritizing of existing funding. Among the proposals in the House Republican budget are initiatives for regionalizing administration and back-office services, addressing the rising cost for special education, free up resources for disadvantaged districts and an initiative to boost Career and Technical Education. The referendum passed in November specifically directed the funds to be allocated to teachers. Simply adding more money to the system will not assure teachers and students benefit. There must be specific strategies in place to assure our teachers who are most directly affecting our students are properly compensated. This must be the priority. Rep. Heidi Sampson serves on the Education and Cultural Affairs Committee. She represents District 21, which includes Alfred, Newfield, and parts of Limerick, Parsonsfield, and Shapleigh.